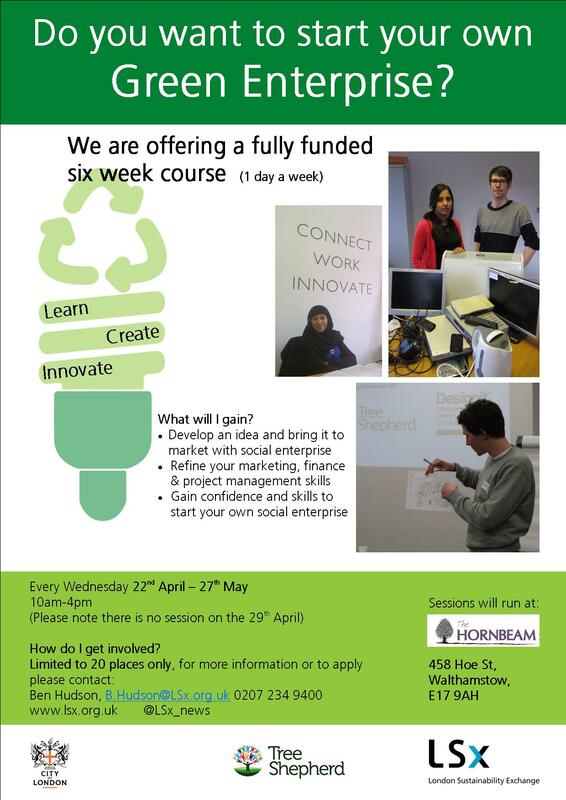 The Hornbeam Centre is delighted to announce a superb opportunity for potential Green Entrepreneurs in Waltham Forest. It has partnered with the London Sustainability Exchange to offer local entrepreneurs the chance to take part in a free 1 day a week, six week programme. The programme will offer the group a chance to learn, innovate and create. The workshops will take place at the Hornbeam, 458 Hoe Street every Wednesday from 10 am – 4 pm from 22nd April until 27th May (there will be no session on 29th April). Places are limited and there is high demand. To book your place or find out more, please get in touch as quickly as possibly with Ben Hudson at LSX on B.Hudson@lsx.org.uk or 020 7 234 9400.